Meanwhile, prepare sauce and veggies. Place cauliflower in a large microwave-safe bowl with 1/4 cup water. Cover and microwave for 6 minutes, or until soft. Drain excess liquid. In a blender or food processor, combine cooked cauliflower, Parm, 2 tsp. garlic, 1/2 tsp. salt, and 1/4 tsp. pepper. Add milk and 3 tbsp. warm water. Blend on high speed until smooth and uniform. Bring a large skillet sprayed with nonstick spray to medium-high heat. Add mushrooms, onion, remaining 1 tsp. 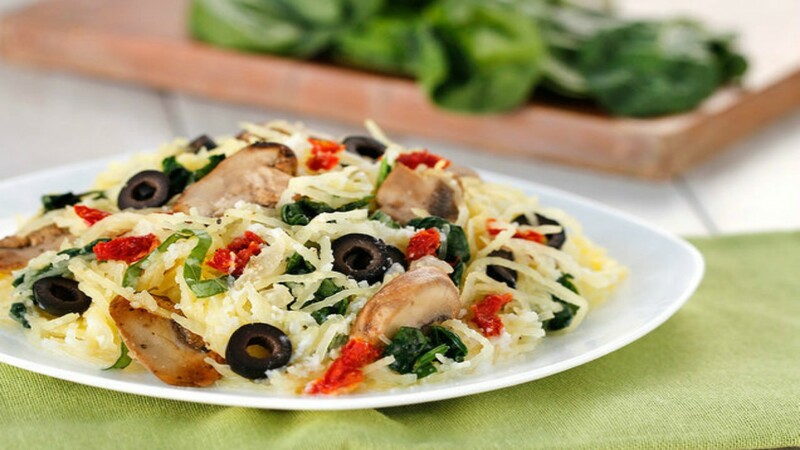 Add spinach, sun-dried tomatoes, olives, and basil to the skillet. Cook until spinach has wilted, about 1 minute. Reduce heat to medium low. Add cauliflower sauce. Cook and stir until hot and well mixed, about 2 minutes. Remove from heat, and cover to keep warm. Add saucy veggies to the bowl, and mix well. down. Add 1/4 cup water, cover, and cook for 7 minutes, or until soft. Repeat with remaining squash half. This recipe is perfect for family-style dinners. 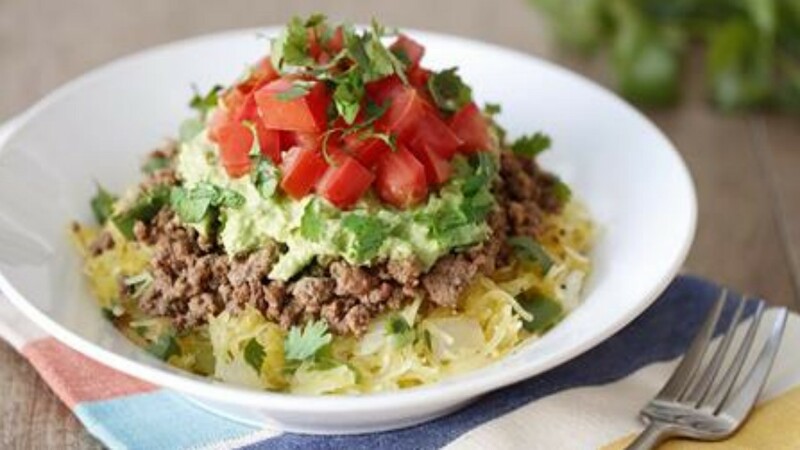 So give taco night a break, and make this ASAP! Slice the stem ends off the strawberries, about 1/2 inch, revealing an opening in each berry. Use a narrow spoon to remove about half of the flesh inside each berry allowing room for filling. In a small bowl, mix ricotta, sweetener, and vanilla extract until uniform. Spoon ricotta mixture into a bottom corner of a plastic bag; snip off the tip of that corner to create a small hole and squeeze the mixture into the strawberries. Top with chocolate chips and enjoy! HG Tip! If you want your stuffed berries to stand upright like ours do in the photo, cut a thin slice off the bottoms so they sit flat. Preheat the oven to 350°F. 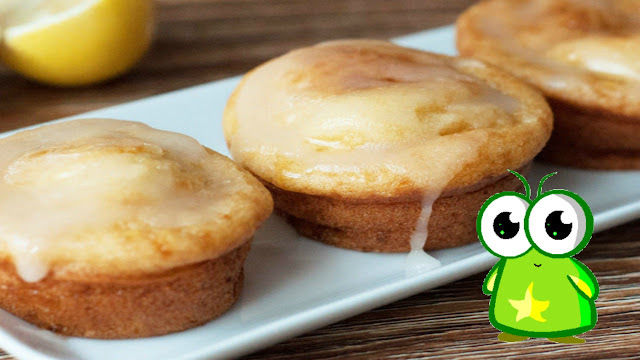 Spray a 12-cup muffin tin with nonstick cooking spray and set aside. In a large mixing bowl, sift together flour, baking powder, baking soda, and salt and set aside. In another large mixing bowl, whisk together coconut oil and eggs until a smooth consistency. Add coconut palm sugar, raw honey, and Greek yogurt and mix again. Add vanilla extract, lemon juice, and lemon zest and whisk well. Add dry ingredients to the mixture. Using a spatula, fold them in together until smooth. Divide the batter between muffin tins and bake at 350°F for 18-20 minutes or until a toothpick inserted comes out clean. Take it out and set on a wire rack to cool off. Enjoy! Combine all glaze ingredients together and mix well. If needed, adjust powdered sugar and lemon juice for desired consistency. Glaze should easily drizzle off of a spoon or fork. Once consistency is reached, drizzle over slightly warm muffins. 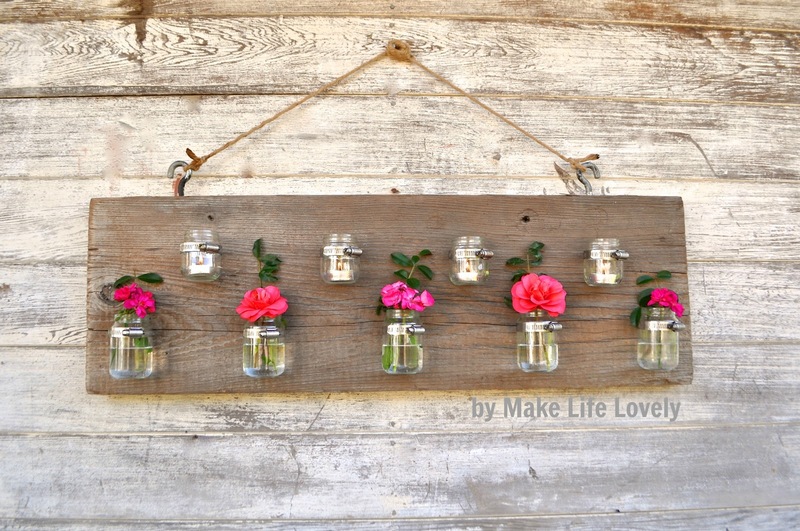 I love the versatility of this decoration I am about to show you! Have I got you curious yet?! 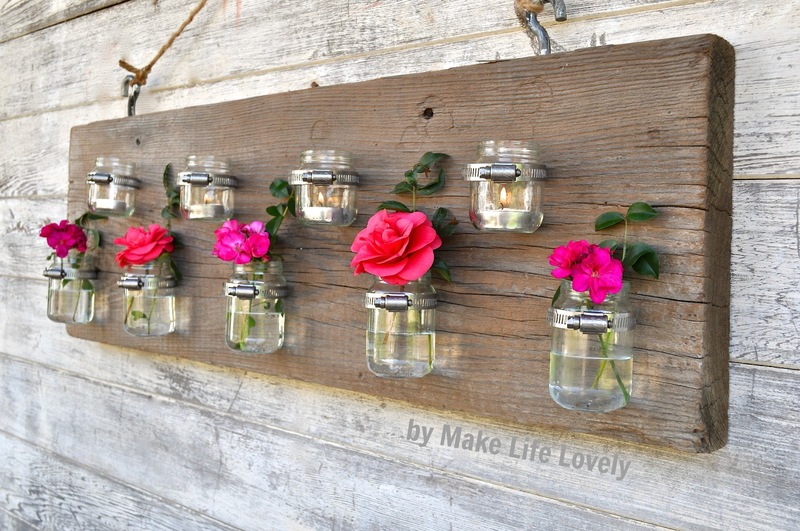 My husband and I used an old piece of distressed wood we already had, and attached nine baby food jars to the wood with clamps, then added two hooks to the top to hang it on our shed. 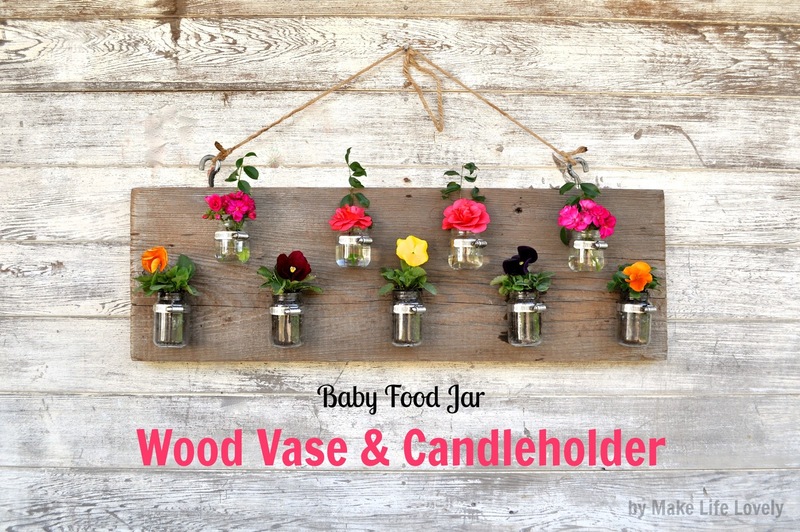 It is such a unique look, and I love that I am reusing an old piece of wood and baby food jars that would have gone into the trash! 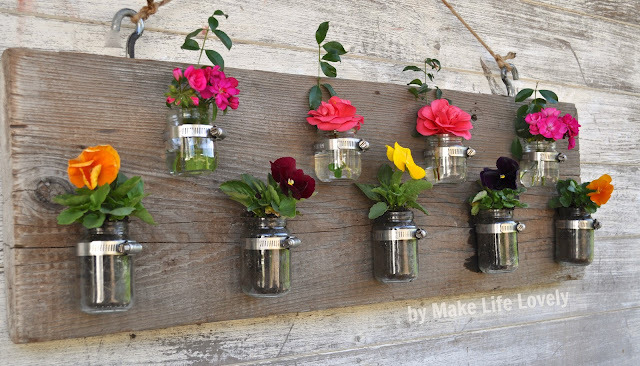 The flowers give such a pretty pop of color to our shed, and the flowers can easily be changed out to include new cut flowers, planted flowers, soil and seeds, candles, etc. I’ll show you some of these varieties later in the post. Endless possibilities!! 1. Brush the wood off with a wire brush to remove any dust and dirt. With a hammer and a metal punch (or a screwdriver, if you don’t have a punch), punch a hole in the metal clamp to make it easier for the screw to go through (you will be drilling it in step 3). Make sure you place a piece of wood underneath the metal, and punch the opening on the opposite side of where the clamp tightens. This will be the spot where the clamp is screwed into the wood. 2. Measure and mark where you would like the baby food jars to be placed on the wood. Place a clamp on your marking, with the part that you punched touching the wood. Drill the screw into the opening. Repeat with all of the jars. 3. 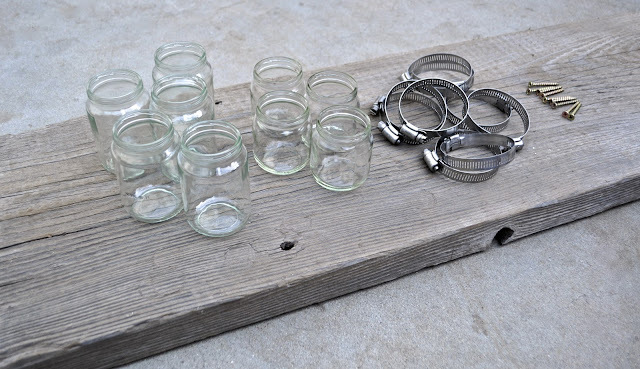 Place the jars inside each clamp, and tighten again so that the jars are nice and snug. 4. 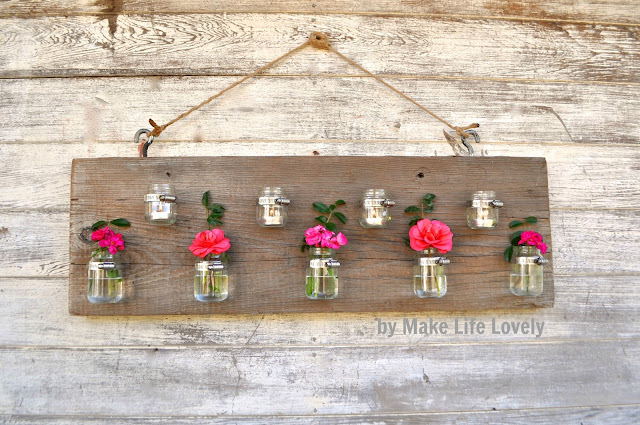 To hang the decoration, you will need to mark where you want the two hooks to go on the top of the wood. Drill a hole on each side that is deep enough for the hook to go through. Twist each hook into the hole until it is tight. String a piece of jute, twine, etc. 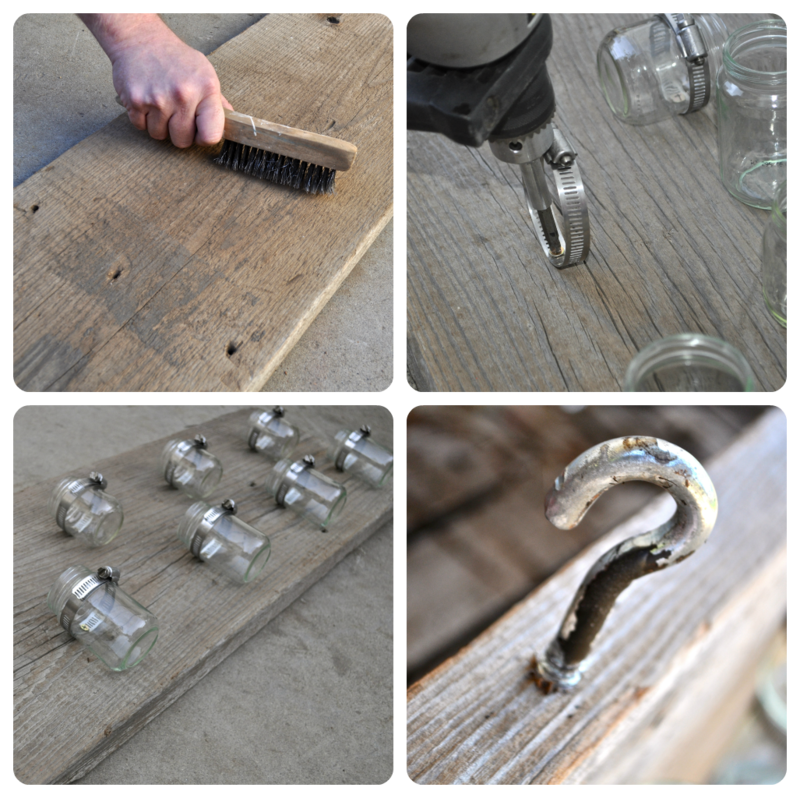 through the hooks, knot each end, and hang with a nail wherever you would like. We hung ours outside to spruce up an old shed. This would also look great on a patio, or inside the house. 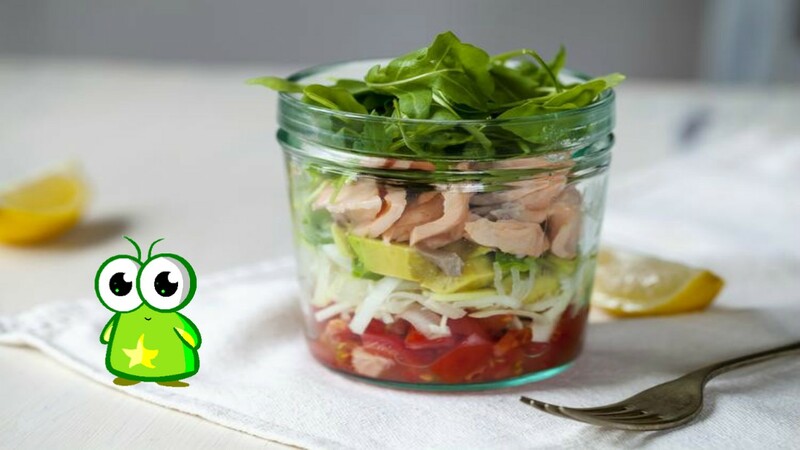 So now that you have made this little beauty, it’s time for the fun part- filling the jars!! 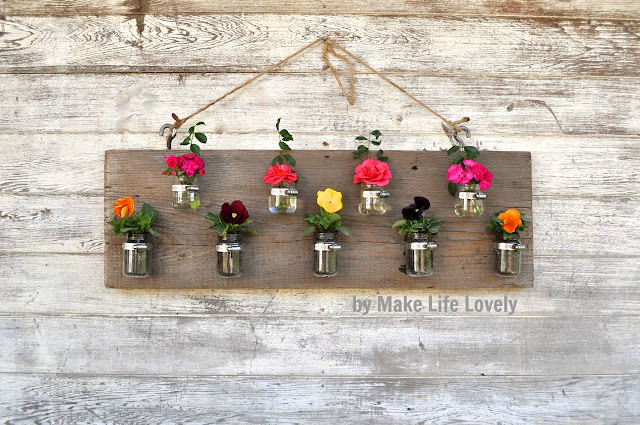 We cut some geraniums and flowers from our yard and placed them in water on the top. Geraniums are great to put in the jars filled with water because the cuttings root in water. Once they have grown some roots, you can plant them in the jars on the bottom in soil. Once they grow even bigger, you can transfer them to bigger pots, cut some more trimmings, put them in the water, and keep the cycle going!! The petunias we planted on the bottom fit in the larger baby food jars, but just barely. 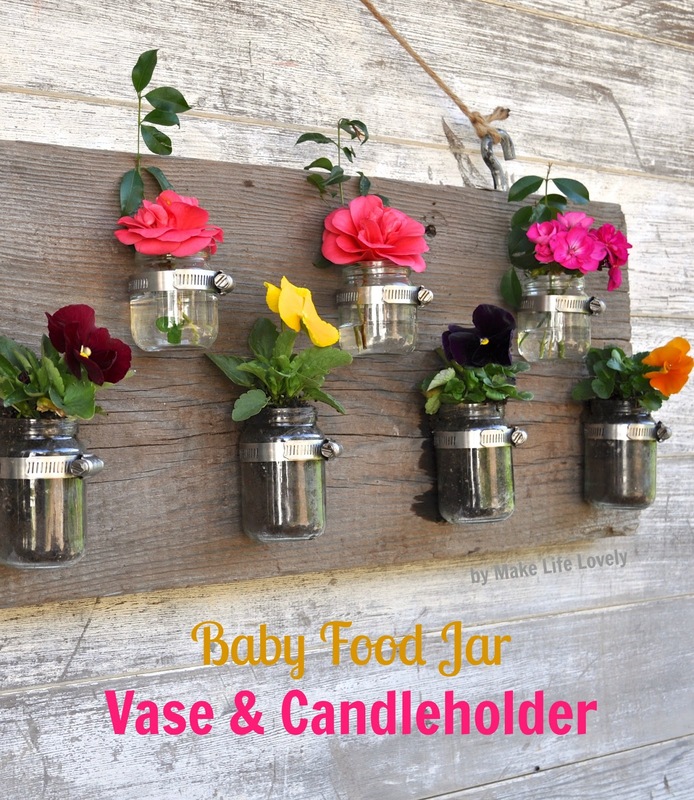 The jars with soil in them are perfect for growing plants from seeds, or little seedlings. Again, once they outgrow their containers, you just transfer them over into a bigger container. I love the look of these tea lights in the jars, especially at night. Make sure that you do not leave the candles lit unattended, and keep them out of the reach of children!! I also filled all of the jars with tea lights, and the effect was so pretty! 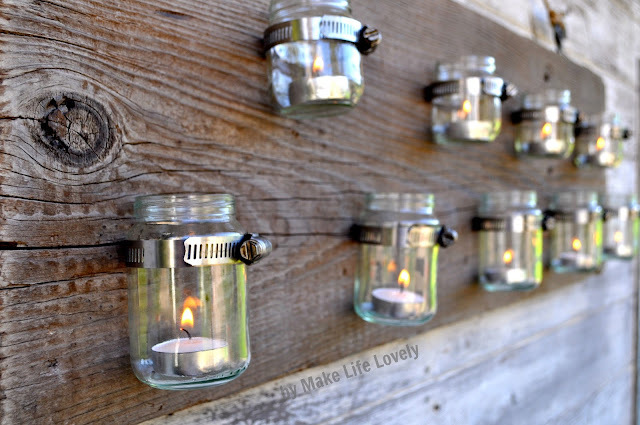 This would be a great decoration for a backyard barbecue or evening fire, or even for a little ambiance in your home. As you can see, there are so many fun things you can do with this. Get creative, and save those baby food jars! 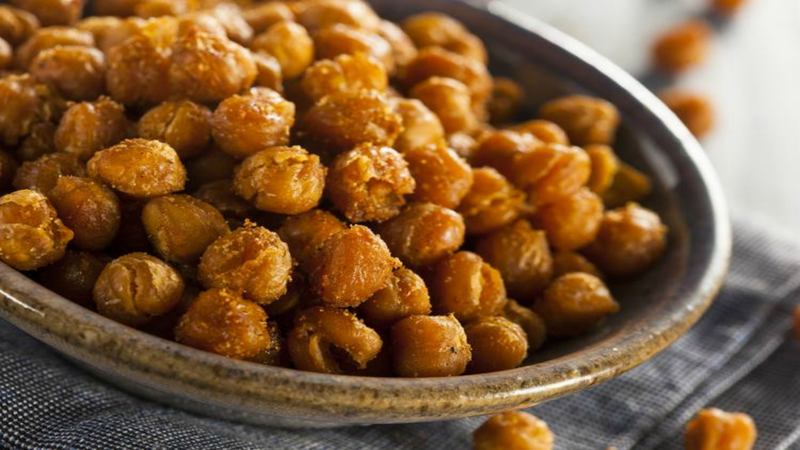 After drying chickpeas, toss in a bowl with olive oil and salt. Spread in an even layer on a baking sheet and bake for 25-30 minutes, until crunchy and golden. Combine the remaining spices and sprinkle over the roasted chickpeas. Allow to cool slightly and enjoy! If desired, loosely tint foil over the chickpeas to prevent popping while in the oven.